What a massive disappointment “The Royal Family” has turned out to be. I was once told that ‘expectation’ is a dangerous thing as you are setting yourself up for disappointment. Well, I was disappointed at the Haymarket last night. I felt a wonderful opportunity went to waste. I mean, what on earth was Peter Hall thinking of? He masterly brings together a cast to-die-for, including Judi Dench, Peter Bowles, Julia McKenzie, Harriet Walter, Philip Voss and Toby Stephens and then chooses a play that is basically average at best! What a tragedy!! Written by George S Kaufman & Edna Ferber, this play is loosely based on the Barrymores, the First Family of American Theatre. It is set in New York in the 20s and concerns a family of unruly actors consisting of the grandmother, daughter, son, granddaughter, uncle and his wife. Now, please understand, just because I said I was disappointed, does not mean I did not enjoy the show! On the contrary seeing this cast in anything is worth the ticket price. It is just that I thought a better quality play would have made this a masterpiece, which is what I was expecting. The first act is considerably poor, and provided few laughs for the audience, whom appeared to remain stoical throughout the act. The action laboured and the script rambled on for long periods. There was also irritating arguments and chatter, with all the cast speaking at the same time which was fine on the first couple of occasions but became increasingly irksome with each repetition. However, in the second act the play begins to draw you in and you begin to warm to the characters and care for them. To be fair maybe the author was building a foundation for the characters in the first act so as to be able to explore their foibles in the second and third? Judi Dench plays the widowed Fanny Cavendish, the grandmother. A formidable lady who believes it is important that the Cavendish acting dynasty continues. Judi Dench is like her character, formidable. But, her massive talent is so under-used and wasted on this character, which is not nearly as central as probably it should have been. Most of the time Dench is reduced to quick fire put me downs or one-line jokes, not at all funny in and of themselves but Dench’s delivery makes them so. In fact, Dench’s performance is exceptional, like it is in everything she does. She is particularly wonderful when pretending to faint when hearing the news that her granddaughter is to quit acting. The graceful way she faints, hamming the part for all the sympathy she can get, is a delight. The whole company are, as one would expect, wonderful in each of their characters with Peter Bowles as Uncle Herbert, trying to resuscitate his poor acting career, who constantly argues with his wife, Kitty, played hilariously by Julia McKenzie. Harriet Walter, as Fanny’s daughter, Julie, who is beginning to feel she has sacrificed too much to be an actor, gives a solid performance. And Toby Stephens (son of Maggie Smith), is particularly funny as Fanny’s son, Tony, a dashing young man who prefers film work to the stage and is always running away from someone or something. Toby Stephens has again shown what a versatile actor he is. I have seen him many times on the London stage in recent years and he has been impressive on each occasion. There is also a warm performance from Philip Voss, as Oscar, the family’s agent. The play has received luke-warm notices from the popular press......... NICHOLAS DE JONGH for THE EVENING STANDARD describes the play as a "thin theatrical meal - superlite almost." He goes on to describe it as an "elegant resuscitation.....superbly acted production". SHERIDAN MORLEY for TELETEXT says, "The Royal Family has never been a good play, as Noel Coward and his star Olivier noted when they last put it on over here in 1930....... In the end, as in all old-fashioned theatre, sentiment overtakes satire." BENEDICT NIGHTINGALE for THE TIMES says, "Brisk, entertaining revival". But goes on to say, "The plot could be tenser, the stakes a bit higher. The lines could also be wittier and the comedy funnier.." MICHAEL BILLINGTON for THE GUARDIAN says, " Like so many other American period piece, the play also often mistakes commotion for comedy and mania for mirth. " PAUL TAYLOR for THE INDEPENDENT says, "Flamboyant all-star revival but the wit is thinly spread." He goes on to say, "The Royal Family is too often a right-royal let-down. " JOHN PETER for THE SUNDAY TIMES loved it saying, "Peter Hall directs a superb piece of ensemble acting: headlong speed is combined with cunningly articulated pace, and the crescendos of the family rows are masterpieces of orchestration." PETER HEPPLE for THE STAGE says, "Peter Hall's production is not really worth the amount of time, money and talent that has been spent on it ." Without this terrific cast the play would have died, but they do manage to save the show and bring the best out of an average script. 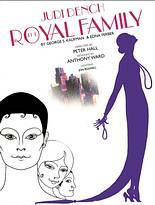 I suggest you see “The Royal Family” but don’t expect a great play. Instead, just go and lie back in your seat and enjoy a cast of exceptional talent. It takes a certain kind of production to suit the gilded interior of the Theatre Royal, Haymarket, and Peter Hall’s production of George S Kaufman and Edna Ferber’s The Royal Family, contains more than enough glister to match its surroundings, and indeed for much of the time surpasses them. 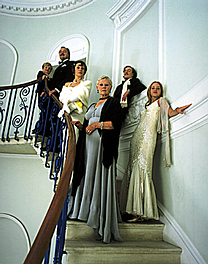 The play is set in the lavish New York apartment of the Cavendish family, a theatrical dynasty spanning three generations. Set in 1927, Act I opens as the family comes and goes, discussing their current productions and plans with each other, with their manager and with anyone who will listen. For each of them, their devotion to the theatre will be tested as the play progresses, with proposals of marriage, the arrival of a baby or former lovers. Indeed already one member of the family, Fanny Cavendish’s son Anthony, has left the stage, tempted by the bright lights and glamour of Hollywood. It is his hurried return to New York, late in the first Act that sets the piece alight. Brilliantly played by Toby Stephens, Anthony Cavendish is on the run from the wrath of a jilted lover, who just happens to be the wife of his erstwhile Hollywood director. Act II takes us through the following day, as Anthony prepares to sail for Europe to escape pursuit, and find himself – again. His departure seems to signal the beginning of the end for the tradition of acting in the Cavendish family. Times moves on, and a year later, we find that Anthony is still away in Europe, Gwen (Fanny Cavendish’s granddaughter) has had the first child of her recent marriage, and Julie (Fanny’s daughter) is preparing finally to leave the theatre and head to South America with her former love. Yet, as in Act I, the reappearance of Anthony from Europe sets all ablaze once again, as he returns to his theatrical roots. The story provides a thinly veiled, and in its day controversial, insight into the life of a true New York theatre dynasty, the Drew-Barrymores, and a highly entertaining view at that. More importantly though, it provides a vehicle for acting of the finest quality, with strong performances from the whole ensemble, in particular from Toby Stephens as the tear-away, incorrigible son Anthony, who turns his back on the theatre for greater delights in Hollywood, before, having travelled through Europe regaining his inspiration, returns to the theatre with rekindled passion. Harriet Walter also gives a marvellous performance as Julia Cavendish, Anthony’s sister. After year’s establishing herself on the Broadway stage, she too decides to give it all up, in favour of a love that she passed up on 20 years earlier, but who has returned to give her a second chance. There are also splendid performances from Peter Bowles and Julia McKenzie as Fanny Cavendish’s failed brother and sister-in-law, as well as Philip Voss, the delightfully camp family manager. But, as well as being a highly entertaining and amusing piece, and providing some terrific acting performances, The Royal Family, is a triumphant return to the London stage for Judi Dench, demonstrating, if we needed reminding, why she is truly the Dame of the London stage. Her performance as the matriarch of the family is outstandingly powerful, exhibiting a wonderful versatility, mixing humour and gravitas. Peter Hall’s direction and Anthony Ward’s tremendous set combine with all this to make The Royal Family a terrific night’s entertainment, and another West End production not to be missed. Regarding "The Royal Family," I agree entirely with Darren Dalglish's review: a spectacular cast makes this unremarkable play worth seeing, for three reasons: some extraordinary performances (in particular, the brilliant Judi Dench and Toby Stephens); fabulous Art-Nouveau costumes; and a worthy cause. I heard through the theatre grapevine that Sir Peter Hall and his band of allies mounted this production (and the next one, "Lady Windemere's Fan," with Vanessa Redgrave and Joely Richardson) to save the Theatre Royal, Haymarket, by establishing it as a producing theater, rather than let it either fold or be annexed as one in a stable of corporate-owned venues. May they prosper!